We interrupt the regularly scheduled blog entry to talk about a miniatures game I tried out this week: Infinity. Leader guy with a Mark 3 rifle (shoots 3 round burst). Flashlight chick (who has a gun that blinds people in addition to a submachine gun and a pistol). All of my characters had fairly similar statistics in the double digits and it quickly became apparent that you want to roll under your statistic on a D20 in order to succeed at what you're doing. There are also D&D style modifiers making the game feel more like an engagement of well established D&D characters than a fight between useless minions. Before the game started it was explained that our objective was to hold a strategic objective (an outhouse) in the middle of the table and that we had 3 turns to do that in. Shomphoof and I shrugged and got started by rolling to see who got the first turn and who deployed first. I won the roll and got the first turn. Stomphoof got to pick the table side and forced me to deploy first (an advantage because he can see where my forces are before deploying his guys). 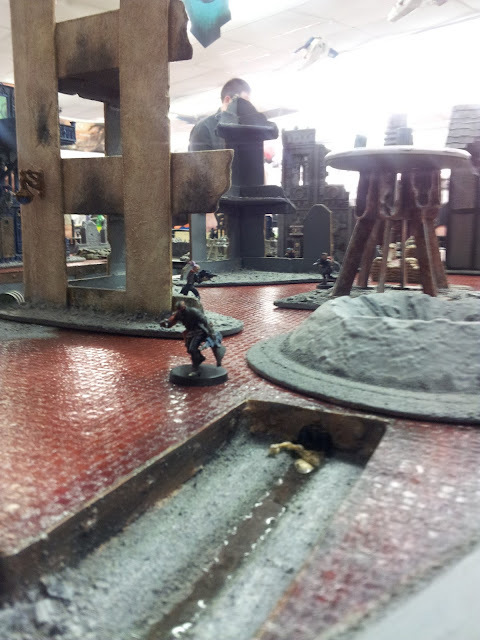 With a 12'' deployment zone on my boarder of the square table, I set up my guys in cover, and my sniper on top of a tall gun emplacement/missile silo that had a clear view to the objective. I was told that this game uses a model's line of sight (meaning that if the model can physically see another model, the two can both shoot at each other) and that immediately made me happy to hear. Stomphoof had a "linked" unit, which moved as one and shot as one but all of my models were entirely independent. I watched as he deployed his guys behind cover (you have to be "touching" cover to get the benefit of cover) in his deployment zone. Turn 1. I got a number of Orders equal to the number of models I had alive +1... So 7 orders. Each order can be used to either "Move/Move", "Move/shoot", "Shoot", or on some other actions (like climbing buildings) that we didn't get into too much. The first thing I did was move my Leader guy into line of sight with the enemy on the complete other side of the map. He got an immediate "reaction" to this and decided to shoot at me... Reactions are pretty cool and make it so if you run past an enemy's line of sight, they can either "dodge, shoot, or ignore" you, before you declare your second action. If you move out of cover at any point during the first move you don't get the benefit of cover as they shoot at you. Solid enough rules that I agree with. Now I had to start thinking tactically. So, after moving from cover to cover I shot at the guy who decided to take a "reaction shot" at me. His shots missed, and 1 of mine hit (pictured below). You roll based on your statistics, reduced by range, and special abilities (my guy has an optical disruptor, giving people a -6 to shoot at him and cover, which is an additional -3 to hit). I rolled a 4, which was well under what I needed, so I hit him while he missed me. Then he got an armor save (you roll OVER your armor value, which is modified by the gun's Armor Piercing value) and by fluke his armor deflected the shot. After being hit and not being wounded, he took a Willpower test (for being shot and surviving) and failed, forcing him to hide behind cover. I was feeling pretty good about this, so I moved rocket dude into the line of sight of another bad guy and shot at him with my rocket launcher (which shoots 2 rockets at a time!!). I rolled and got one hit, but Stomphoof's reaction was to shoot at my Rocket dude. Because his guy succeeded in hitting me, and rolled higher than my guy (who also hit his target) Stomphoof's rocket guy hit and cancelled out my shots. My Rocket dude failed his armor roll and was knocked out (0 wounds = unconscious, -1 = dead), but because we lacked medics this effectively meant he was dead. Upset at this I declared that my sniper would shoot at Stomp's rocket guy in revenge. His reaction was to shoot back at my sniper with his last rocket. The exact same situation played out and his rocket guy killed my sniper chick. 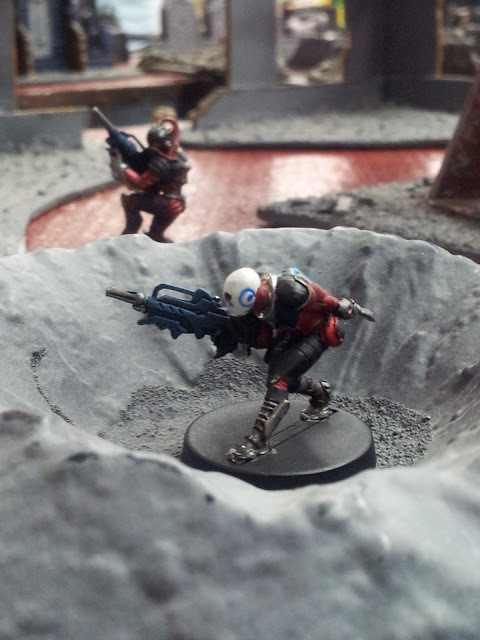 By this point I was seeking revenge because this guy effectively no-scope blind-fire murdered 1/3rd of my kill team BEFORE IT WAS EVEN HIS TURN. It reminded me of X-com: Enemy Unknown in a good way. The rest of my turn was spent moving my Leader guy forward and (successfully) shooting Stomp's rocked guy to death while evading incoming fire. In this game you can spend multiple Orders on the same unit each turn (no cap), which is justified thanks to the whole reaction phase of the game. (Every time you shoot at someone, they can shoot back). Despite a few people in the shop muttering about how difficult the rules to Infinity were, Stomphoof and I picked up in the gist of the game in under 20 minutes and found them infinitely (no pun intended) more simple than Warhammer, 40k, or any variations therein. True line of sight (with both models being able to shoot each other if one model can see the other), their approximate range modifiers, and the low model count make the game (once you understand the basics) go by fairly quickly without much room for rules disputes and it's already my favorite miniatures game this side of "Warhammer: Path to Glory." Stomphoof's turn was one of tactical movement. We learned how to interact with terrain (physical checks where you roll under your relevant statistic after modifiers are calculated based on the terrain) as he jumped through windows, into a half-pipe sewer system that led to the objective, and safely hid underneath a bridge without getting a single successful reaction shot from my side. His models were mostly close combat orientated so it made sense that his goal was to run towards the objective without being seen. On my second turn, with significantly less actions this time around, I climbed a building (at the wrong part of the building admittedly, exposing myself to lots of unwanted but unsuccessful reactive gunfire in my direction) and shot at the guy under the bridge from a vantage point. In short, he returned fire, killed Flashlight chick, and was killed by Leader guy. I was told that his Leader had died (which normally causes all sorts of panic) but this his forces were religious fanatics and didn't care. My Leader guy took a bullet to the face and also didn't care because he's a robot and never falls unconscious, despite dropping to 0hp. 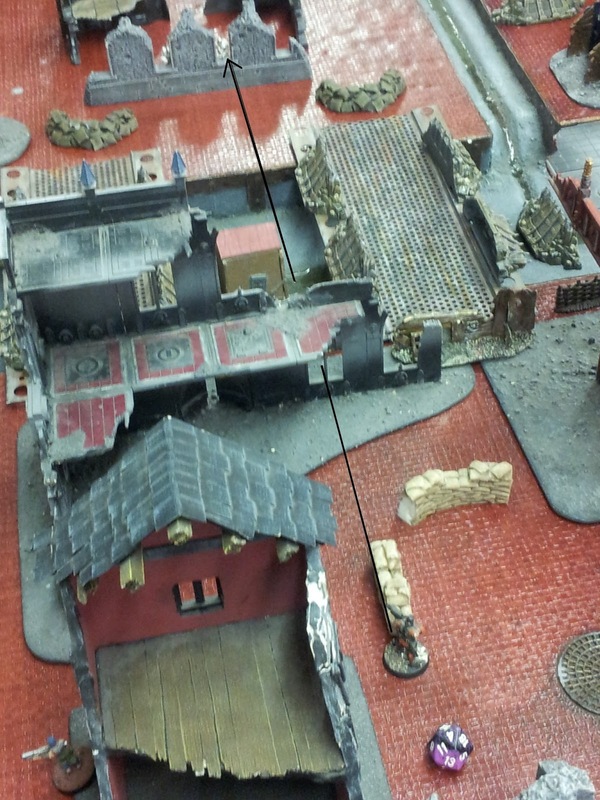 I moved the rest of my forces into position to take the objective and ended my turn with everyone in cover. Stomphoof's second turn allowed his linked squad to see my Leader guy and shoot at him while they were jumping through a broken window. Despite my best efforts, Leader Dude was shot to death and I pondered why I hadn't used the visibility blocking smoke grenades earlier. 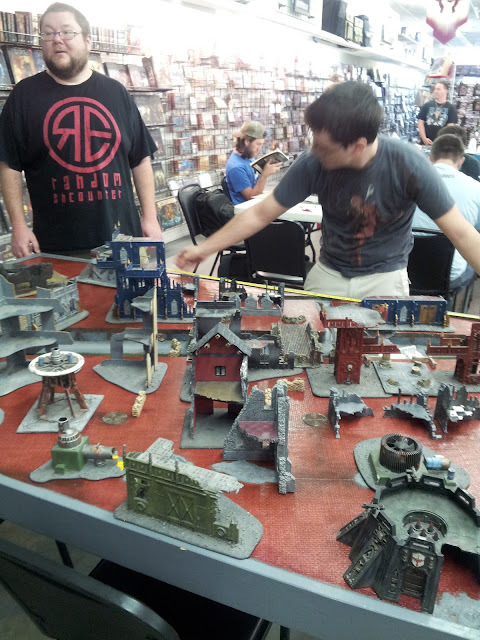 It was at this moment that we learned about the rule that if a player drops to 2 models or less, they immediately run away/forfeit. Game over and I still felt really good about things. It's a smooth game where your turn never really seems to end (because of the reaction phase) and I felt like I fought an evenly matched battle. I was already itching for a more tactically played rematch the moment we shook hands but time constraints prevented this from happening. Now, a few days later, I'm in the process of figuring out which army I want to play... I'm including my thoughts here and should/when I get to building/assembling models I'll also share that in future posts. Pan Oceania: They're the ultra-prosperous super-nation. Tech-heavy but still very human, the models seem like a crusader army mix of man and machine in an art style that doesn't appeal to me. They seem like a tough opponent though. I think this is what Stomphoof played last game. Yu Jing: They are regularly described as a mix of ninjas, samurai, and transformers, which doesn't interest me much. 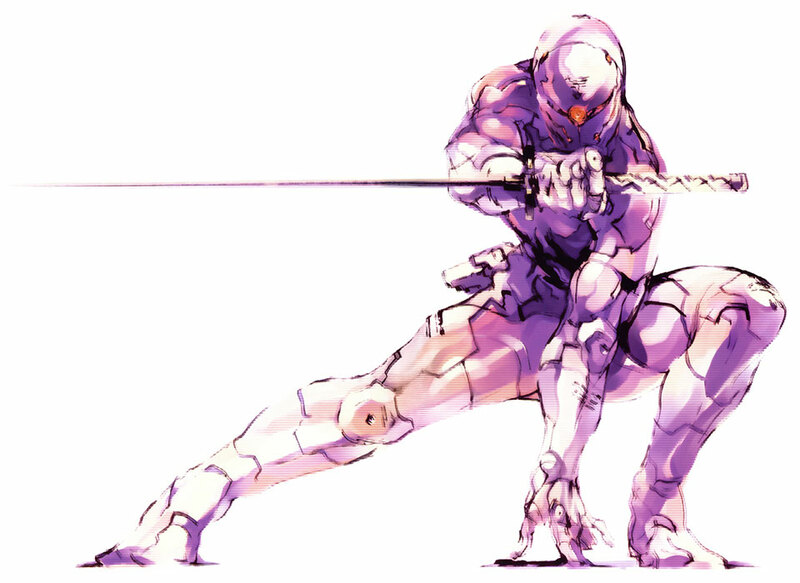 The models look neat, very Cyborg Ninja, which isn't my thing despite being awesome. Ariadna: They are modern tech highlanders, were-wolves, French, Russians, and Americans in a sci-fi world. While that makes them sort of redneck (using early 2000's technology in the year 2150) it's in the running for the faction of choice. I never really understood the kilt thing, and am not really all that into werewolves (being in a band that specializes in hunting them), but a Russian-American-French army seem kind of neat. Haqqislam: Harmony seeking Islamists aren't normally my style but it looks like a very hit n' run army, which greatly interests me. This would be a sniper-town army. Nomads: Bandits, traders, and ex-cons who've banded together. This initially was my choice until I saw the models and realized that they're basically an anime faction. While some of the models look absolutely awesome the fact that their forces include a cat girl automatically excluded them from being a viable faction in my eyes. Combined Army: A super faction of alien races. Stomphoof called it the "Monkey Man and Bug Army" and I can't really disagree with his assessment. While Stomphoof said he'd pick this faction and I agree that the models look awesome, bugs and monkey men are not my thing. Aleph: An AI faction filled with cyborgs, Tron-bikes, and references to Greek mythology. It reminds me a lot of System Shock for some reason and I'm interested in them for that alone. I'd probably make a robot army led by a SHODAN look alike. Tohaa: Bio-tech aliens that strongly remind me of the Council Races from Mass Effect. This faction strongly interests me for aesthetic purposes, and the fact that bio-warfare means extra damage with each hit. The downside is that they only seem to have 9 different models available at present. I'm told that they're the newest faction in the game, which would help explain this, and i'm not above converting models if the rules for the army aren't horrible. Mercenaries: Corporate warriors and a large slew of awesome models. Sadly they seem banned in most games that my friends take part in or I'd likely pick them. I'm really leaning towards Tohaa, Aleph, Ariadna, or Haqqislam but am at a bit of a split decision. While i'm in the process of picking which faction I'm going to play I welcome any comments suggestions and thoughts you might have on the topic. Mercenaries are only banned in Tournament play, most friendly players will allow them in casual play. As far as Aleph goes, non-sectoral Aleph running Asuras and 'bots can be terrifying, provided you field the right units. Plus, you'll be avoiding all your units going nuts and rushing the enemy like they would in the Steel Phalanx. Tohaa look sweet, viral weapons are terrifying, and their bio-armor makes them tough. You can see more of their units if you use the Aleph Toolbox Army Builder (google it), there just aren't models yet. Haqq and Ariadna can definitely be hit and run, but their low-tech just reminds me of 40k's Imperial Guard. But with Werewolves. You can always proxy other models for lists you make in the Toolbox, and then commit to an army once you've found one you like the feel of. That sounds viable... I think I'm going to playtest Bots, Tohaa, and Haqq. If you go Corregidor sub-set of nomads you don't get the anime aspects. Been playing nomads (corregidor specifically) for over a year now. Nomads are best at hacking and dirty under-handed tricks. (Lots of airdrop, Camo and To camo, and excellent remotes/robots). Tohaa are also a lot of fun. Keep this in mind: most aleph and combined troops are expensive (point-wise). So you will almost always have less troops on the table than your opponent. But you get what you pay for with their troops. Thanks Joseph! I really need to start reading more into the sub-sets and put nomads back on my list of options. Just finished the (lengthy) fluff intro of the rule book, so I'm slowly making progress. Your comments were very helpful. Is there any kind of a campaign system for the game? That's really been the thing holding me back from being interested - a campaign system where models can grow and learn over course of several games. Or die horribly, of course. From what I've been told they exist. The structure of the subsequent games is effected by if you completed primary or secondary objectives too. I'm guessing that these campaigns would be in either the core book, or the various expansion books but haven't been able to check them out yet.